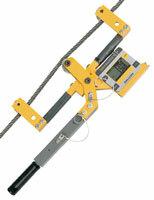 Elevator Cable Tension Meters for weighing and balancing elevator cars. Accurate and easy-to-use. Contact our experts to review your application. For material diameters: up to 46 mm, 1-3/4"